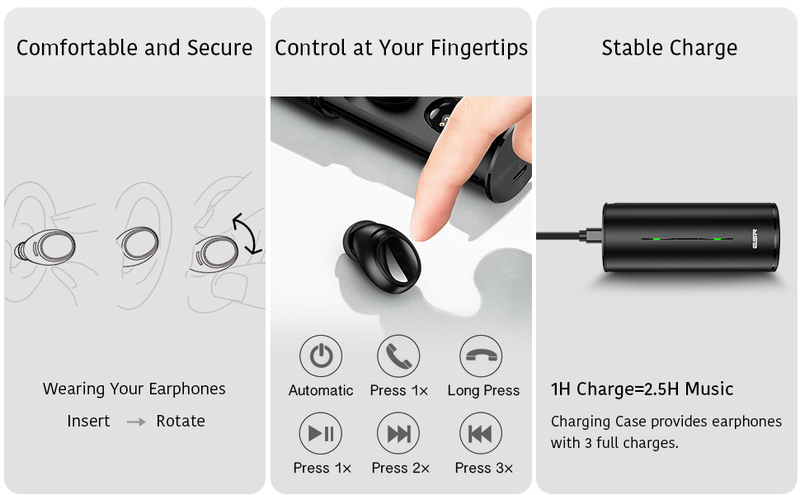 Extended Playtime: Fully-charged earphones give you 2.5 hours of music playback while the compact charging case provides the earphones with an additional 3 full charges for a total of 10 hours of music all in a convenient-to-carry form. Magnets within the case lock the earphones into place to charge automatically. Stable Connection: Bluetooth 4.2 provides a connection range of over 32 ft. and stable audio streaming. Please Note: 1. Bluetooth signals can be temporarily disrupted by traffic lights, tunnels, or other strong wireless signals. 2. When speaking on the phone, due to the earphones’ location on the side of the head, audio may be picked up more quietly. 3. When playing data intensive mobile games, audio may sometimes be slightly delayed. Crystal-Clear Sound: Excellent sound quality lets you get the most out of your music. The dynamic graphene drivers reduce distortion, and provides a full range of sound from strong bass to crisp highs for audio that’s true to real life. Single-Ear Headset Calling: Since the audio channels for true wireless earphones are completely independent, there will only be sound signal in the left side during calls. Most true wireless headphones only support single-ear calls and work like traditional Bluetooth headsets when making calls. Big Tech, Small Package: Extremely light and small; the 4.5g (0.16oz) earphones and 60.5g (2.13z)solid charging case are easy to carry and let you enjoy your music wherever and whenever. An ergonomic design and a full range of eartip sizes gives you a customized fit that’s comfortable and secure. To avoid hearing damage, keep the volume at a moderate level. Avoid listening to music at loud volume levels for prolonged periods of time as this may cause permanent hearing damage or hearing loss. Do not use the ESR T1 when it is unsafe to do so. For example, while operating a vehicle, cycling, crossing a road, or any activity which requires your attention and ability to hear. Please disconnect the USB cable after charging is complete. Product should not continue charging for extended periods of time. Please use the original charging cable and a charger or adaptor with a max voltage and current output of 5V/1A or 5V/1.5A when charging. If the output voltage and current of the charger exceeds these specifications, it will cause severe damage to the product. ✓ Q1: What should I do if the earphones cannot connect to my phone? Put the earphones back into the battery case and take them out again to reenter pairing mode. Make sure the earphones have power. If needed, please put the earphones into the charging case to charge for at least an hour. Make sure the phone’s Bluetooth is turned on, and confirm that the phone’s Bluetooth is not connected to any other Bluetooth devices. 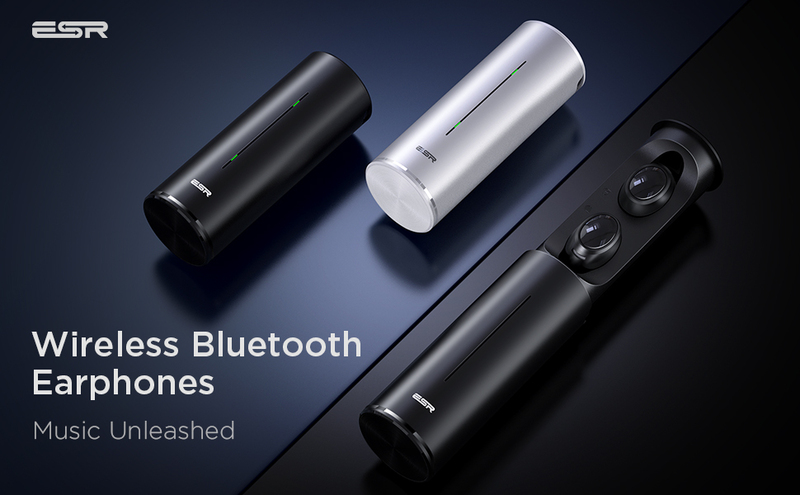 Bluetooth is a point-to-point connection, and can only connect to one device at a time. ✓ Q2: Why is the connection unstable? 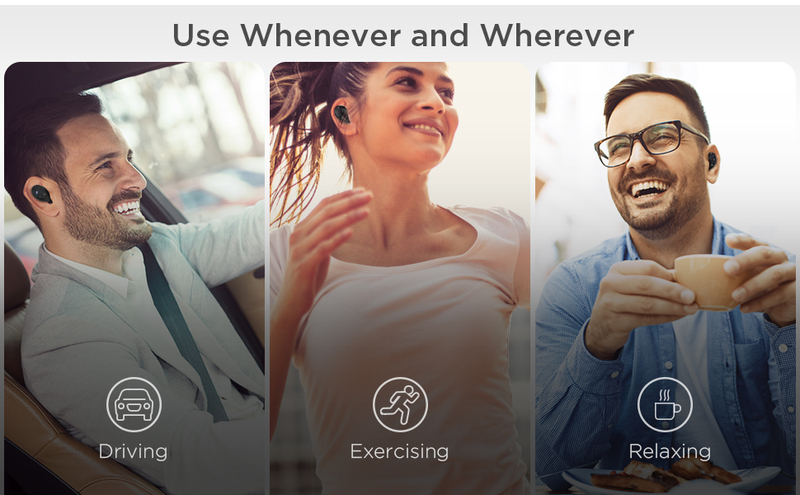 Because Bluetooth uses wireless communication, places with other strong wireless network signals (such as airports, near traffic lights, and areas with strong Wi-Fi signals) may interfere with the earphones’ Bluetooth connection. This interference should be minimal during normal use. ✓ Q3: When making a phone call, why is there only sound in one earphone and my voice is not very loud to the other party? Since there is no cord on truly wireless earphones, the microphone must be located directly on the earphone itself. Due to the distance between the microphone and the mouth, it may sometimes be necessary to speak louder or use a hand to direct sound back to the microphone. Also, like nearly all wireless earphones, the two audio channels are completely independent. Since the audio during a call is mono and not stereo, only one earphone will have sound. ✓ Q4: Are the earphones comfortable and stable even when running or during other activities? This product is ergonomically designed and comfortable to wear. To ensure not only the best, most comfortable fit, but also the best audio experience, please choose the best-fitting ear tip for you and wear the earphones according to the instructions. I always buy wireless headphones because I workout so much better when I am able to pick my music as opposed to the gyms music. Usually when they say wireless they still have that wire that connects them. However these are truly wireless. I love love love that! The ones with the wire usually that wire gets sweaty and mixed in with my hair. The quality is exceptional. I actually just added two more as gifts for my gym friends. Stays in my ears when running, volume could be louder, and battery life isn’t consistent. Bin sehr zufrieden damit! Akkulaufzeit ist ok, angemehm zu tragen aber eine Spur zu Leise!